It's fun and all for a great cause! You make Schnauzerfest possible, without hosts, it wouldn’t happen! You bring tonnes of happiness to people and dogs, and have fun while you're at it! Interested? Read on and contact us to find out more! Picks the day (the Saturday/Sunday of the Schnauzerfest weekend), time and location. Chooses a location, which should have plenty of parking, be easily accessible and allow off-lead walking for dogs. Refreshments are handy, but not essential. Public toilets are advisable. If the location is a managed one, check a group of dogs will be welcome, better still, choose an unmanaged place where everyone will be free to enjoy themselves. On the day, guide people on the chosen route. Check the Facebook Event regularly and answer any questions that are posted by people wanting to join your walk. Being sociable before the walks really helps! Some hosts collect donations and submit the money online afterwards. If you would rather not do this, no problem! Just say and we'll sort it. We encourage walkers to donate directly to the online link as that way they can claim Gift Aid (if eligible), increasing their donation by 25%. No responsibility for anyone or dog not their own is expected of hosts. Certainly not beyond what we'd all do on any walk with other people. Contact us to register your interest or for more information. 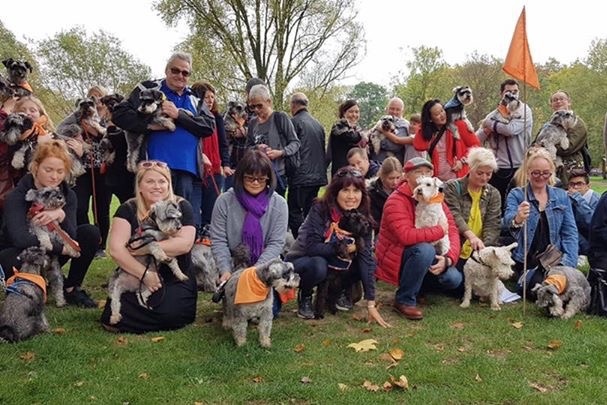 Group photos of previous Schnauzerfest walks - you could be the next host in your area!